A Study Of Buddhist Philosophy & The Creativity In Contemporary Art, an exhibition of artists inspired by the Buddhist concept of 'dharma', opened at BACC on 28th February. It will close on 5th May. 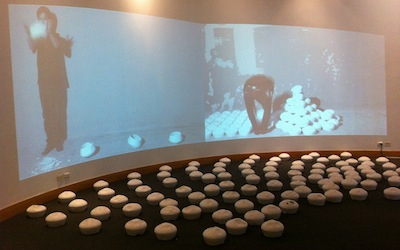 The exhibition includes an installation by Vichaya Mukdamanee, who has filmed himself dropping a series of ceramic urns. Vichaya's video was presumably inspired by Ai Weiwei's famous performance in which he dropped a priceless Han vase.